Strapless ball gown wedding dress with skirt made with organza ruffle strips. A lighter version of "Diana". 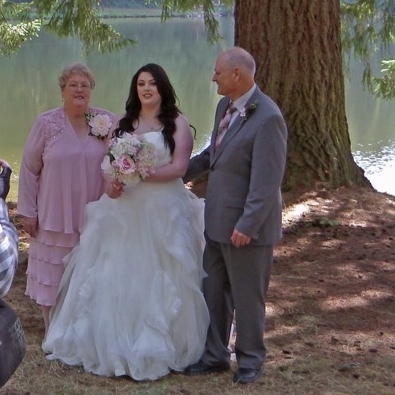 The dress looks even better in our professional wedding photos. Thank you so much again Wendy! Ever since I was 12 and saw the Vera Wang "Diana" dress I fell in love and knew it was the dress I wanted to get married in eventually, but knew I could NEVER afford it. Once I stumbled on "Chanel" (ieie's lighter version of it) I knew my search was over. I was a little apprehensive about ordering my gown online, but Wendy was so helpful every step of the way. Very responsive to emails, and she made sure all my measurements were just right. 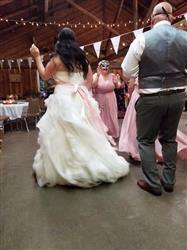 I waited 10 weeks while she worked her magic and when I received the dress I could not believe my eyes! It was so well made - it had boning on the inside and an elastic bra strap sewn into the back to keep everything in place, the ruffles and rosettes were beyond gorgeous, and she even modified the gown to have a corested back so it wouldn't have any alterations to make. 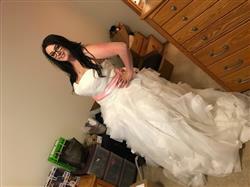 The gown was light, easy to move in, and best of all it wasn't too tight and I felt like I could breath and sit in it with no issues whatsoever. I love my dream gown! So affordable and I can't wait to get married in it. My fiancé is going to FLIP when he sees me in this gorgeous, gorgeous dress! Thank you so much again, Wendy! I ordered the dress in late July and got it in early September. The shipment was fast (4 days) and the dress was packed very well, and most importantly, I am IN LOVE with the dress! It looks just like the pictures and it fits perfectly. It's exactly my dream dress, and I feel like I'm a princess when I put it on :) While it's sort of scary to purchase a wedding dress online, Wendy's responsiveness made the process much easier. She double checked my measurements right after I submitted my order to make sure I ordered a right size. I am so glad I found Ieie's Bridal Boutique! Thank you for the high-quality dress and the affordable price!